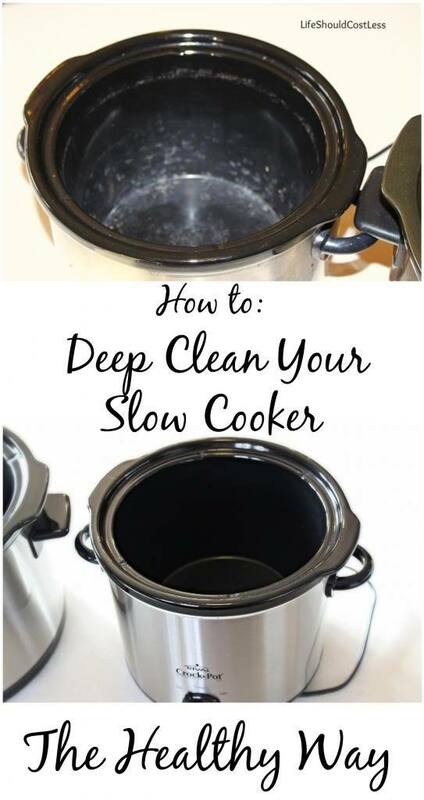 *If you liked my post “How to deep clean your slow cooker the healthy way“, you’re going to LOVE this one too. *A couple of years ago I started cooking with cast iron. Though, I kind of gave up for a while because it’s hard to clean and you really shouldn’t soak it (which is hard for me because I frequently am too tired to do one more load of dishes after cooking from scratch all day and so the dinner dishes become my morning chore) so I kinda felt helpless over what to do. Even though I consider cooking in iron one of the more healthy ways to cook (no bpa like in non-stick cookware, and no copper toxicity that can happen when using copper), I figure that iron is an essential nutrient that we need so it suits me just fine cooking with it… but there just had to be a way to make it a little easier to clean. 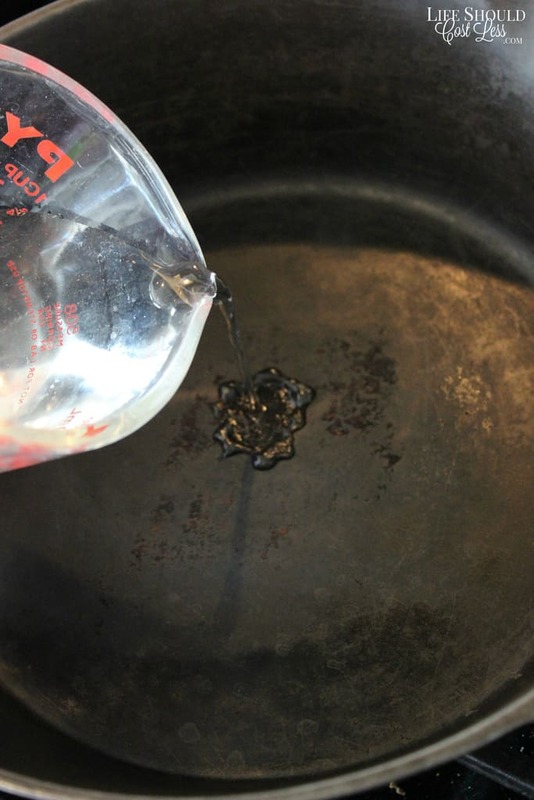 As luck would have it, I was watching someone that has cooked with cast iron for a very long time and they showed me a little cleaning trick that has been passed down from one cook to the next throughout the years. 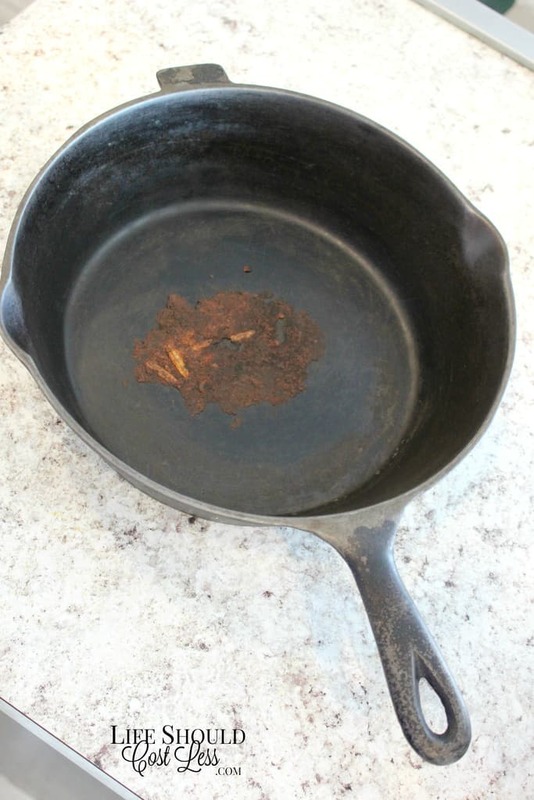 I still consider myself a newbie to cast iron, so I just had to share in case any of you other newbie’s out there need this tip too. 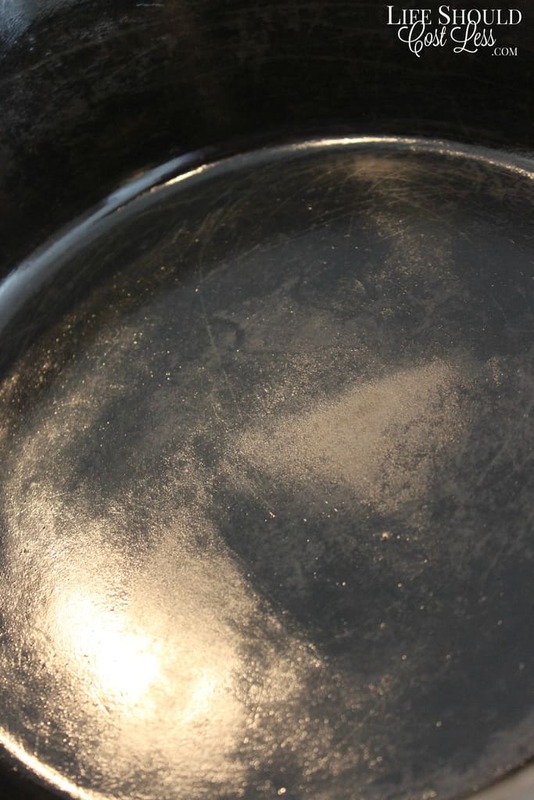 Start out with a pan that has the food on the bottom that just won’t budge. Put it on the stove and let it heat up for a couple of minutes. 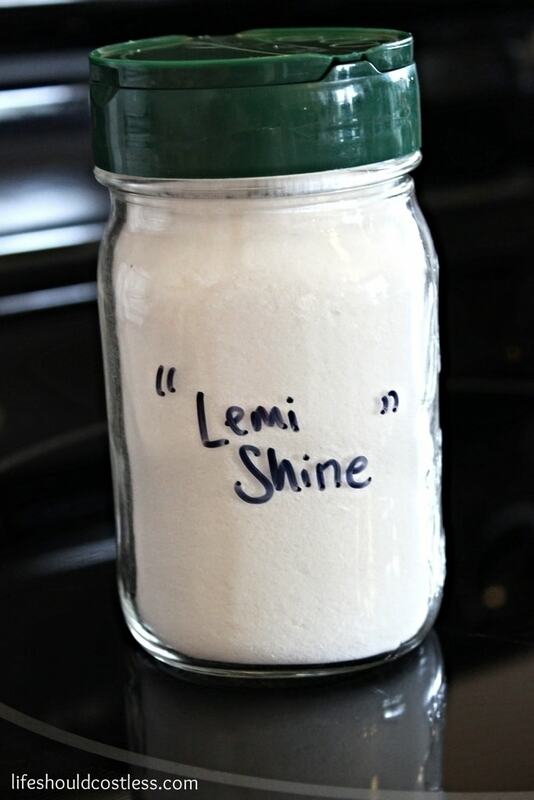 I put it on medium. Once it’s nice and warmed up, take a mug or pyrex measuring cup, and fill it with water (temp doesn’t matter too much, I used luke warm). Then quickly drop enough water to just cover the food mess. It’s going to sizzle like crazy and you let it do it’s thing for a few seconds. 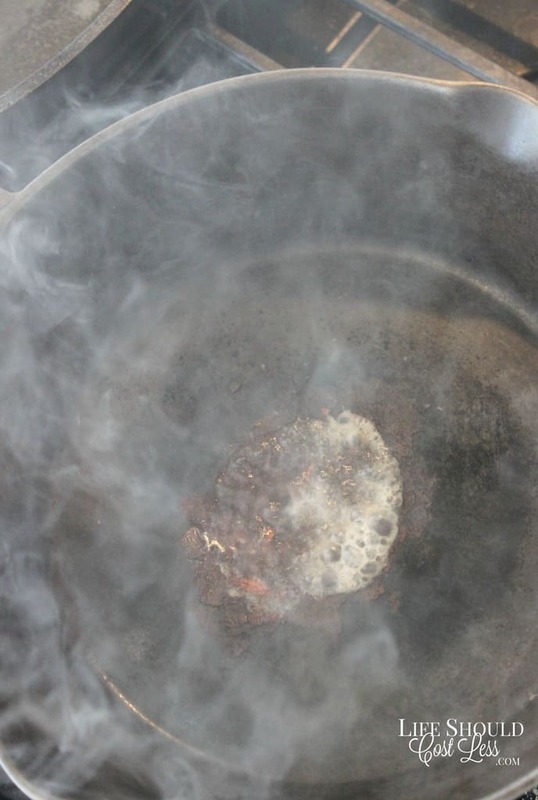 Then, using either a high temp silicone spatula or a wooden one gently scrape off the food. If you must use metal be super gentle. I had to use metal this time and it did just fine. 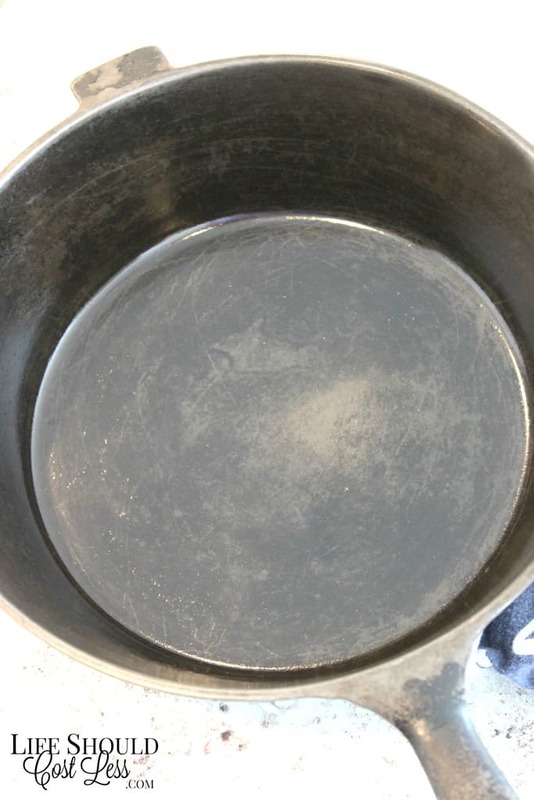 This old beat-up pan is one that I found at a yard sale years ago and it still needs to be re-seasoned…otherwise I wouldn’t dare use metal. This stuck-on food was really bad so I had to repeat it once. 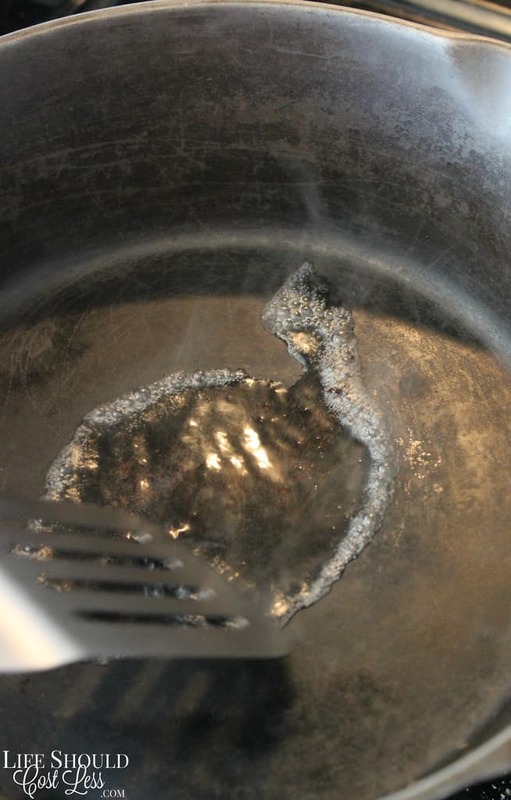 After trying out this tip a few times, I found that you don’t need to wash out all of the food that got scraped off each time you do this, just slide the loosened food out of the way, let the pan warm back up a little and do it again. Repeat until all the food particles have separated from the pan. 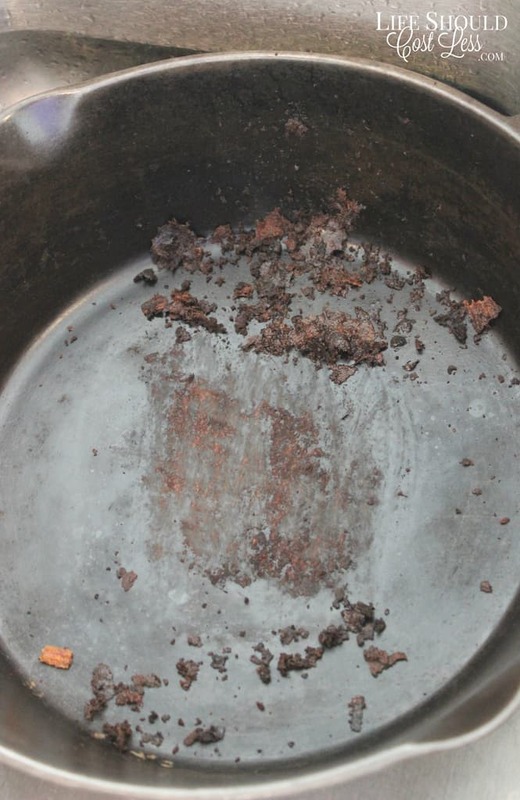 It only takes me a minute or two tops even on a really dirty pan. 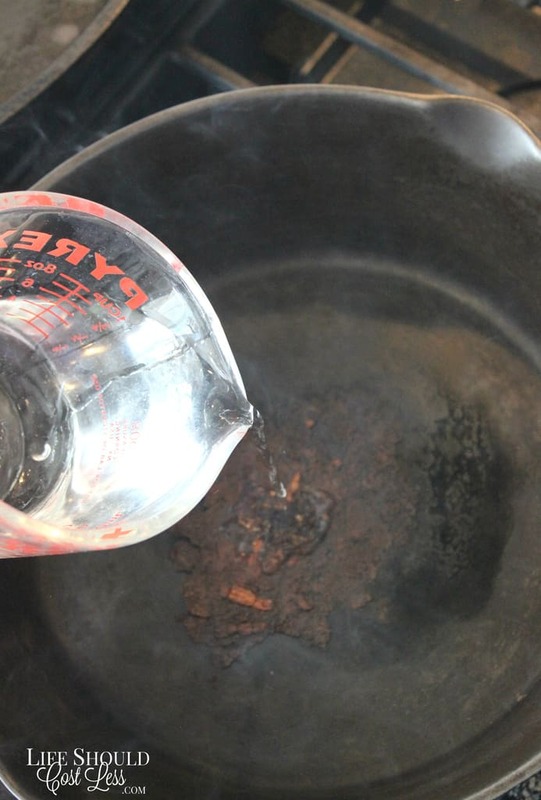 Once you’re done, wash like you normally would, grease it, and thank your lucky stars that you aren’t still scrubbing ten to twenty minutes later.